The Frankfurt Book Fair has informed the public prosecutor's office in Frankfurt that complaints have been made against Iranian exhibitors at the Book Fair. According to information provided by visitors at the Book Fair which ended on Sunday, the collective stand presented by Iranian publishers included books and brochures the contents of which were anti-Semitic and glorified violence. "We have been unable to verify the accusations and have therefore referred the matter to the Frankfurt public prosecutor's office", said Book Fair director Juergen Boos. The public prosecutor's office has stated that preliminary inquiries were launched on Tuesday. In addition to several blogs (and the JTA) picking up this story, the scandal finally reached the German mainstream media on October 26, with an article in the newspaper Süddeutsche Zeitung (complete article text only accessible to registered readers); additional articles will reportedly appear in the German-language press on October 27 (thanks to zuckerlilly for monitoring German-language media). UPDATE: The Western media finally takes notice, as The Wall Street Journal publishes a new essay by Matthias Küntzel in its October 28th edition (WSJ site may require registration). FRANKFURT-AM-MAIN, GERMANY (Zombietone News) -- The official Iranian pavilion at this year's Frankfurt Book Fair prominently featured virulently anti-Semitic literature, in violation of German law. The display was noticed by Hamburg-based author Matthias Küntzel, whose first-hand account appeared Sunday on both the euroneuzeit blog and on the German Jewish site Die Jüdische. The translation pages do not always work consistently, so I have pasted Free Translation's rendition of Küntzel's report onto this page to make it permanently accessible. UPDATE: The Transatlantic Intelligencer blog has just posted an excellent English translation of Küntzel's report; it's much better than the computer versions above. With 280,000 attendees this year, the Frankfurt Book Fair is the world's most important (and by far the largest) publishing industry event, with exhibitors, publishers, buyers, agents and authors from over 100 countries arriving every year to make the business deals that keep the book industry humming. Inside the Iran pavilion at 2005's Frankfurt Book Fair. Somewhere among those books are the anti-Semitic volumes shown above. At the time of this writing (Monday, October 24), the media has not yet discovered the story: the only evidence of it is in a blog entry from UK blogger Colin Meade, who provides rough translations of portions of Küntzel's German text, and an article from the Jewish Telegraphic Agency. 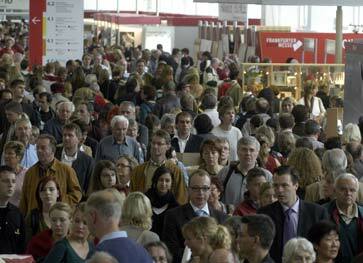 Crowds at this year's Frankfurt Book Fair. For reasons that are unclear, no action was taken against the Iranian pavilion by the German authorities or the Fair organizers, even though the illegal material was in plain view. And it's not as though the company that puts on the Fair ignored the controversy because it tries to steer clear of politics: quite the opposite, in fact. On Sunday, Fair director Juergen Boos told AP, "For 70 years now, the Frankfurt Book Fair has considered itself a platform for political discourse and has been intensively used as such," as he awarded the Fair's 2005 Peace Prize to a Muslim author. This is not the first time anti-Semitic material has been discovered at the Frankfurt Book Fair. A similar incident happened at the 2004 fair when publishers from several Middle Eastern countries were found to be selling intensely anti-Semitic material. But what do the Iranians have to say? Exterior of the large Iran Pavilion at this year's Frankfurt Book Fair. The Islamic Republic News Agency (IRNA), Iran's official government propaganda department, unambiguously declared that the Iranian authorities selected all the material that was displayed at the pavilion: "Meanwhile Barazesh pointed out the good quality of Iranian books which followed an extensive and strict selection process by several literary expert working groups prior to the Frankfurt Book Fair." 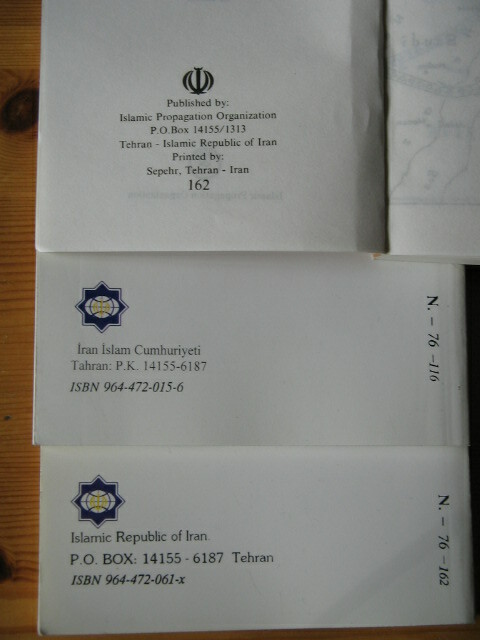 That IRNA press release also describes how the publishers made contacts with Iranians living in Europe: "He added Iranian publishers at the book exhibit had also been successful in establishing cultural links with Iranian expatriates, especially the third generation of Iranian immigrants, in not only Germany but also throughout Europe." In fact it seems the Iran pavilion was heavily attended throughout the Fair, according to a press release from another Iranian governmental department, the "Cultural Heritage News Agency": "There were also some meetings with some of the publishers of children's book from Islamic countries such as Indonesia, Lebanon, Turkey, and Syria. Iranologists welcomed Chinese publishers, and some foreign reporters and deputies and authorities of Germany's Islamic Centers visited Iran's pavilion. Another accomplishment for Iran during the Fair has been signing a contract for introduction of Iran's carpet design with German publishers through the publication of a joint book." Could it be possible that the Germans simply never noticed what was going on at the Iran pavilion? Doubtful. Aside from the meeting that led to the carpet design book mentioned above, IRNS reports that one of Germany's biggest publishers made a deal at the Frankfurt Book Fair to publish a major new translation of the Quran: "A new translation of the Holy Quran is one of the major future projects of the German Suhrkamp Publishing House, a company spokesman told the press on the sidelines of the 57th Frankfurt Book Fair. The project is to begin in fall 2007 and an advisory board of renowned scientists will work on the project for such new Quran translation, according to Suhrkamp spokesperson Thomas Sparr. 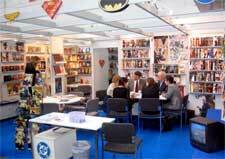 Suhrkamp is one of the biggest publishing houses in Germany." One would think that the Germans would distance themselves from Iran, considering its government-sanctioned anti-Semitism and current drive to build nuclear weapons. But no. Instead, according to another article from an official Iranian site, Germans are having a veritable love-fest with Iran: "'With the year halfway through, Germans have made up the largest number of tourists arriving in Iran so far,' explained director of Iran's Tourleaders' Association, Ibrahim Pourfaraj." Not only did the German delegation at the Fair not confront the Iranians, but, according to Matthias Küntzel, they handed out pamphlets encouraging better contacts between Germany and the Islamic world. Is Germany, by blindly adhering to a universal tolerance of all views, unwittingly opening itself up again to a new wave of anti-Semitism -- the very thing that their ultra-tolerant society was created to ensure would never happen again? Anne Qureshi, the Fair's public relations officer. 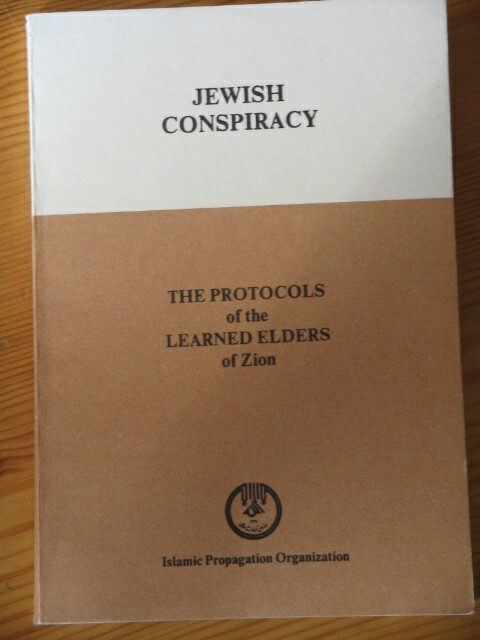 Cover of The Protocols of the Learned Elders of Zion at the Iran Pavilion. 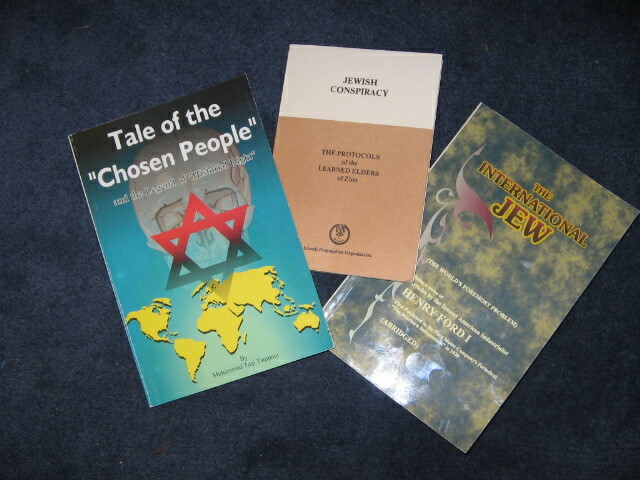 Copyright notices inside various anti-Semitic tracts.